I am so excited about this, you have no idea. I have officially (perhaps accidentally) made the world’s most delicious pizza, and it’s not on the list of forbidden foods. Also, that is an exaggeration. Nothing beats Me-n-Eds pizza. I miss it so much. This may be the world’s most delicious grain free pizza, however. I will still claim this is a victory, and victory is sweet. 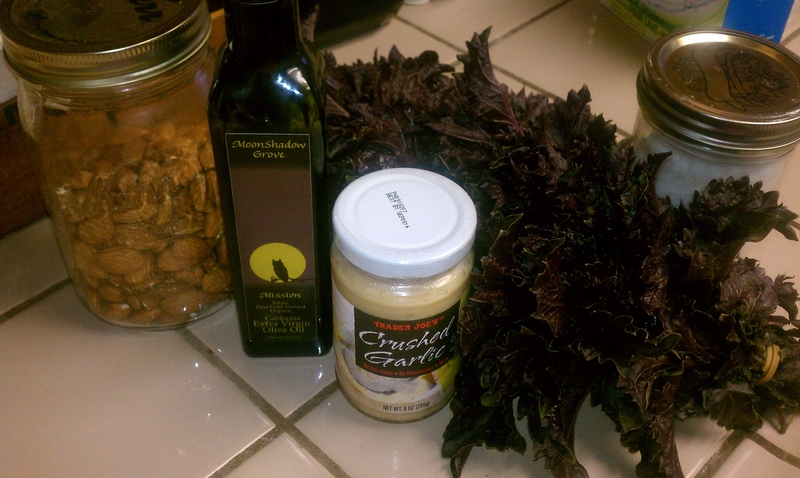 I have tried a few grain free pizza crust recipes and was not terribly impressed. Then I found one made from tapioca flour and it was decent. Then I ran low on tapioca flour and substituted half of the needed amount of tapioca with arrowroot and OMG it was perfection. When made with tapioca flour, it had a certain pie crust quality to it. It was delicious, don’t get me wrong, but the arrowroot allowed it to be a bit more cracker-y, which I really, really liked. I will be saving the original recipe, however, to make the pie crust topping for my favorite chicken pot pie soup. I thought I was going to have to go without it this winter…there is hope once more. 😉 I love beautiful accidents. For the original recipe, go HERE. I made a very simple but delicious pizza using some delicious CSA items the other night. Cracker crust, purple pesto (recipe to follow), sliced chicken breast tossed with some of the pesto, mozzarella cheese and bell peppers. In a food processor or blender, pulse the almonds until they are fine and almost powdery. Then add the basil, and pulse until combined. Add garlic and salt and continue to pulse or blend until all is combined. 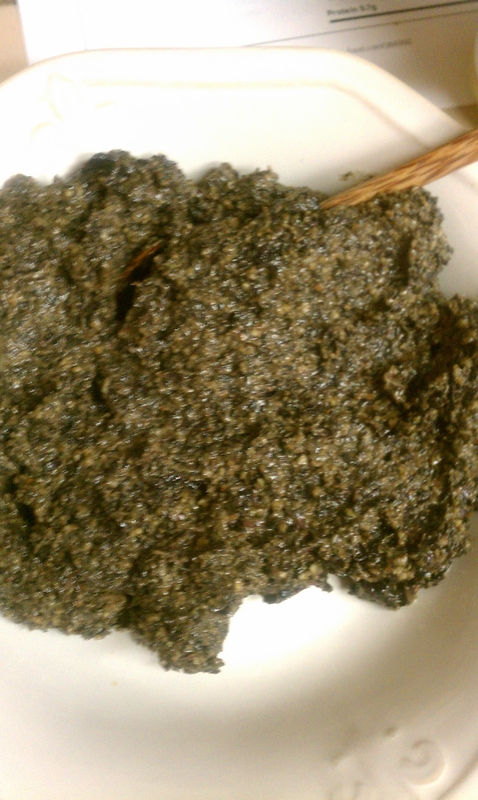 Drizzle in olive oil until pesto is at the desired consistency. I like mine to have enough oil to be spreadable. I probably used about 1/3 cup of olive oil in mine. Keep in mind, from here on out, and I never professed to be a food photographer. Combine all ingredients. It will be sticky and kind of gummy. BRUSH BOTH PIECES OF PARCHMENT WITH OLIVE OIL. IF YOU DO NOT DO THIS, YOU WILL END UP WITH A STICKY MESS. 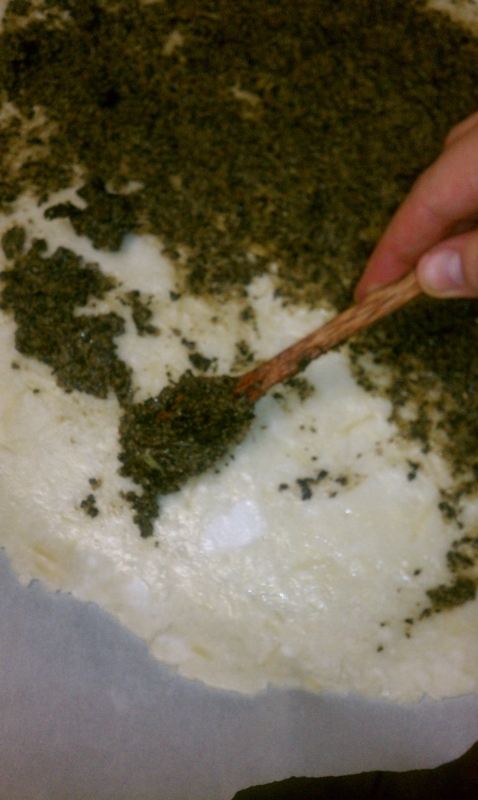 Scrape the batter/ dough onto the first piece of parchment (on the greased side.) Now lay the other piece, greased side down, onto the dough. 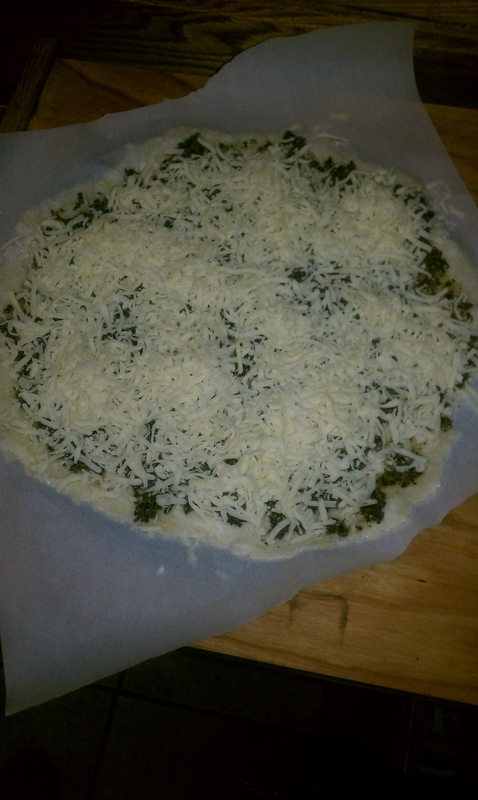 With a rolling pin, roll the crust out into a circle. Peel the top piece of parchment off and discard. Put the crust, parchment and all, onto your pizza pan. Carefully, with the back of a spoon, spread your purple peso over the entire thing. You will use about 1 cup. Reserve the rest for later. 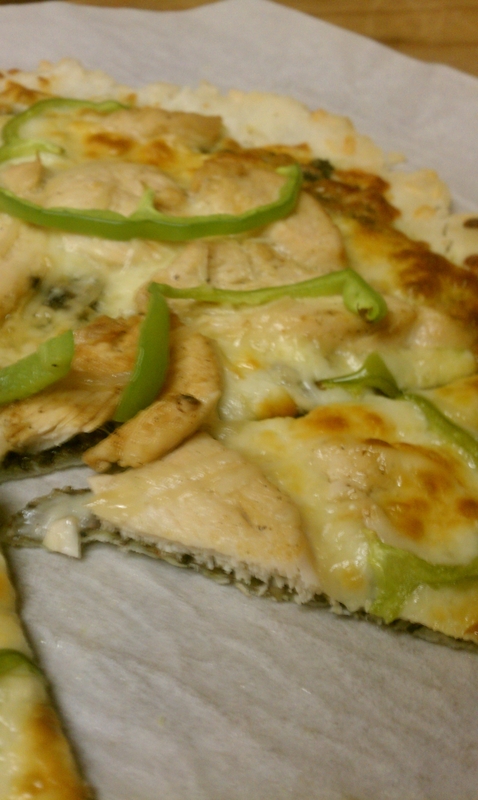 If you would like meat on your pizza, sautee some thinly sliced (about 1/4 in thick strips) chicken breast in a bit of butter or refined coconut oil. (I used 2 chicken breasts) Season with salt, garlic, and then about 1/2 cup of your pesto. 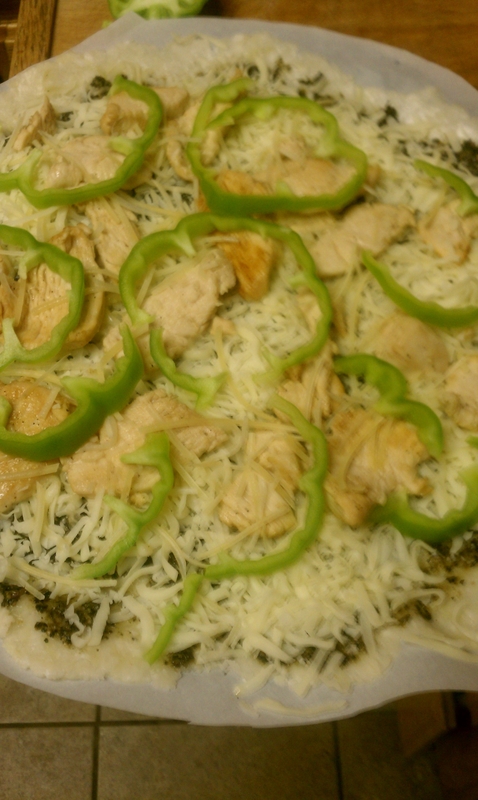 Once cooked, add to the top of your pizza, along with whatever other goodies you want. I added some bell peppers from my CSA box. Trim excess parchment off of the edges and Bake for 20-25 minutes at 400*. It is pretty awesome. I want to eat it every day, but I really shouldn’t eat that much cheese.